I don’t remember exactly when Tucker began bringing things to tell us about. Sometimes it would be something small that he’d pull out of his pocket. Sometimes it would be a photograph or a document that he carried in a manila folder and sat on top of the piano until TST time came. Always, he waits until toward the end of our five-to-seven time slot; often, I have to cue him by asking, “Tucker, did you bring something to share?” He has never said “no” that I remember. Tucker is a collector. Not a collector of any one thing – not like those who collect teacups or garden gnomes or old tools. Tucker is an eclectic collector – everything from shipwreck salvage to World War One posters to German Foresters’ ephemera or old, hand-painted signs. Much of what he collects (but not all) relates to his family heritage. 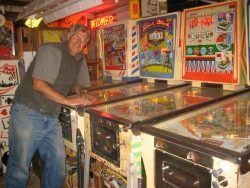 Perhaps the biggest single part of his collection are the pinball machines – over 100 of them at one count– and now mostly in storage while he readies a part of his boat house to serve as an arcade! Last night he brought his Show and Tell on hand truck. (I think that was a first!) 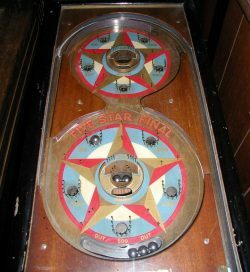 He sat it more-or-less out of sight from the gathering and, when the time came (read: when prompted) presented us with a fabulous 1932 pinball called “Five Star Final.” For a penny, the player could put seven balls in play, including “the gold” ball made of brass. It got double points wherever it landed! In typical Tucker fashion, he gave us a bit of background on the game: “Five Star Final” was a 1931 Hollywood movie based on a play by Louis Weitzenkorn. It was nominated for Best Picture. 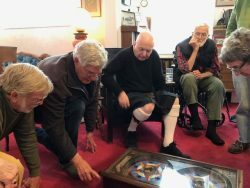 The maker, David Gottlieb, grandson, chose the name because he thought it was the last game he would ever make but, as it turned out, the D. Gottlieb & Company continued making pinballs from 1931 to 1977 when Columbia Pictures Industries acquired the company from the Gottlieb family. In 1983, after the Coca Cola Company had acquired Columbia, the pinball assets of D. Gottlieb & Co. were transferred to a new Coca Cola subsidiary, Mylstar Electronics. What couldn’t be described was the fun that the game provided to last evening’s Friday Nighters! Please report technical issues to the Site Administrator. Thank you.